2010 was a year of transition for the Icon sailing program – throughout the year we made many improvements to the boat and sail plan plus spent significant time on the water. One of the difficulties of a large boat program is that you are often racing the clock and not other competitors. The ability to do well is also highly dependent on the race conditions. After getting 2nd in Swiftsure and being stuck in 4th for the SYC Tri-Island Series we were out for revenge at Round the County. 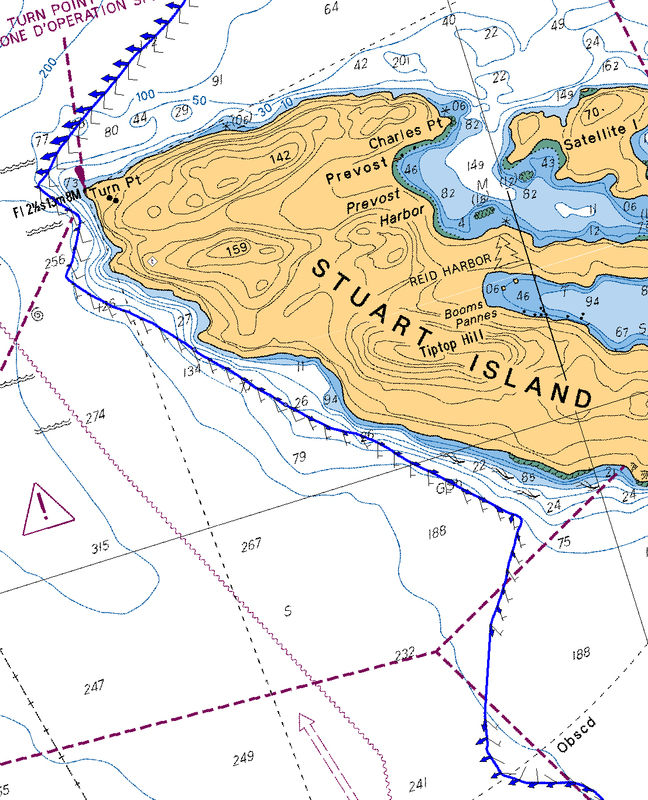 For those unfamiliar with this event, it is a two day race around the the San Juan Islands. 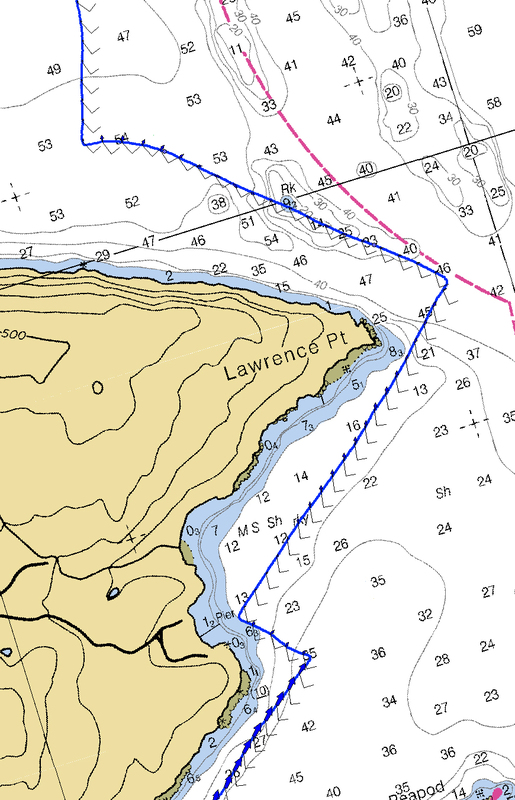 This year the course started off Obstruction Island and headed clockwise around to Roche Harbor for the first day. 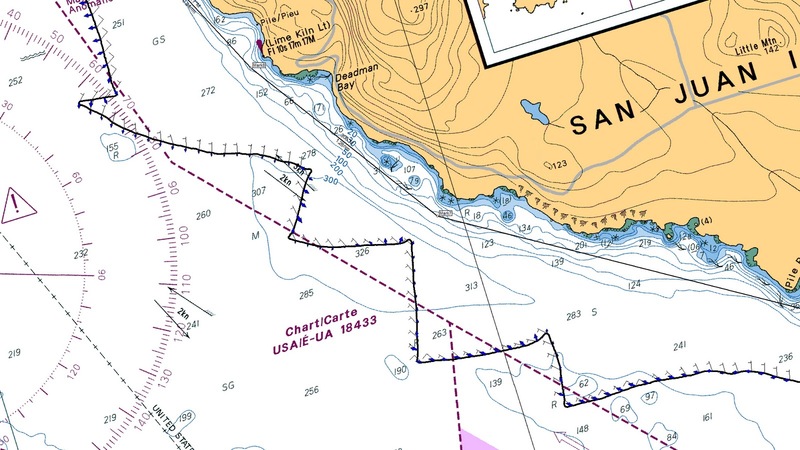 On the second day after staring outside of Roche Harbor the course heads around Turn Point, up Boundary Passage to Patos Island, and then back around Orcas to the same place where we started. We knew well ahead of the race that the first day would be a difficult one for the big boats due to the favorable currents (which effectively shortens the course) and a likely building breeze from behind. We decided to start mid-line as we felt it represented the best balance between the better current on the east end of the line and the increased pressure and less distance on the west end. The current was still ebbing and wind diminishing in Haro Strait but there was more pressure outside so we decided to stay out. Meanwhile Neptunes Car crept slowly up behind us in perfect conditions for their large sailplan with overlapping genoas. The Car took the inside line catching a big lift off the beach and the start of the flood. It soon became clear that the Car had a winning line when they passed us on the inside. We quickly realized that we had to take our licks and head towards the beach, into the better breeze and current. We started to cut into their lead but in the end we simply didn’t have enough time and they finished about 2 minutes ahead of us. Looking south down Haro Strait we could see the rest of the fleet close behind, realizing that we were unlikely to score very well. We knew that the setup on Sunday was going to be much better for the big boats and that to win we had to sail very fast and try to get as far around the course as possible before the wind died and the ebb turned. In order to make good on this strategy we left the dock early giving us time to scope out the first leg. We decided to jib-reach from the start using our Jib top/genoa staysail combination into the current relief behind Stuart Island and play the beach until rounding Turn Point. If the wind was more than 5-6kt TWS from the southwest we calculated that it would be faster to sail the rhumb-line to Patos Island, otherwise our plan was to head for the Canadian shore in search of current relief as we had done in years past. 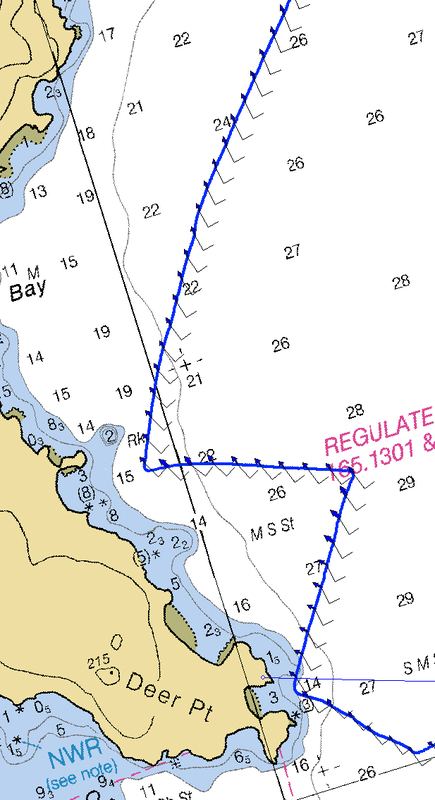 We had a great start and were clear ahead of the other boats in our division while heading for a windless spot southwest of Stuart Island where many smaller boats were already parked. As we sailed into this no-wind area we took down our head-sails and coasted as far as we could. 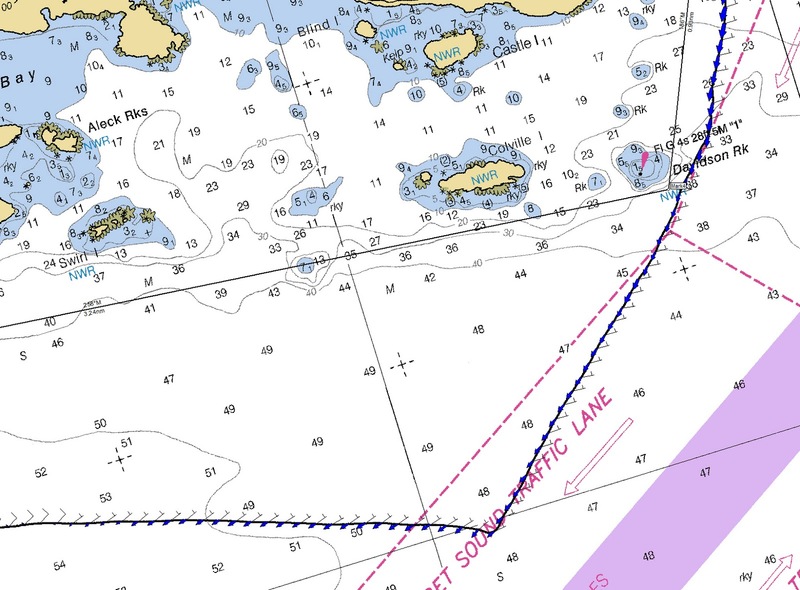 For a while it looked like we would be passed on the outside by Neptunes Car, who powered out into Haro Straits with good breeze. 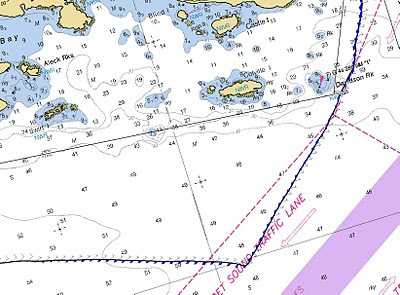 The outside line did not appear to pay though, with the Car eventually tacking to Starboard and appeared to be heading to Victoria! We put up our fractional drifter and did the best we could to keep the boat moving. Eventually a very light wind filled in down Spieden Channel and we put up our A1 and were able to run up the beach to Turn Point with Flash in close pursuit. 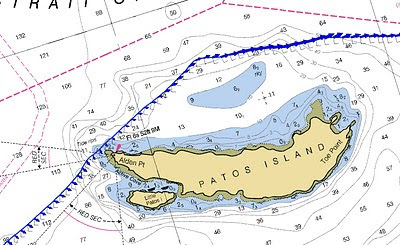 Once rounding Turn Point we saw that the southwest wind had filled in down Boundary Pass and that there was sufficient pressure for us to sail the rhumb-line to Patos Island. As the winds built we hoisted our Spinnaker Stay sail, followed by a peel to our A2 about four miles from Patos. Since we were expecting a significant southward current set between East Point and Patos we ran somewhat deep so that we could come up if the pressure dropped or the current increased. Behind us we saw a number of boats very high on the course and observed that they would have great difficulty getting downwind and downcurrent to make it around Patos. We also observed boats heading for the Canadian shore, which had been our initial plan if the winds were lighter. This didn’t seem to work out either. Shortly before reaching Patos we switched from our Spinnaker Stay Sail to a Genoa Stay Sail in anticipation of using our double-headed rig between Patos and Pt. Lawrence. There was a big glassy spot northest of Patos so we took the corner wide, hoisted our Jib-Top and doused the A2. 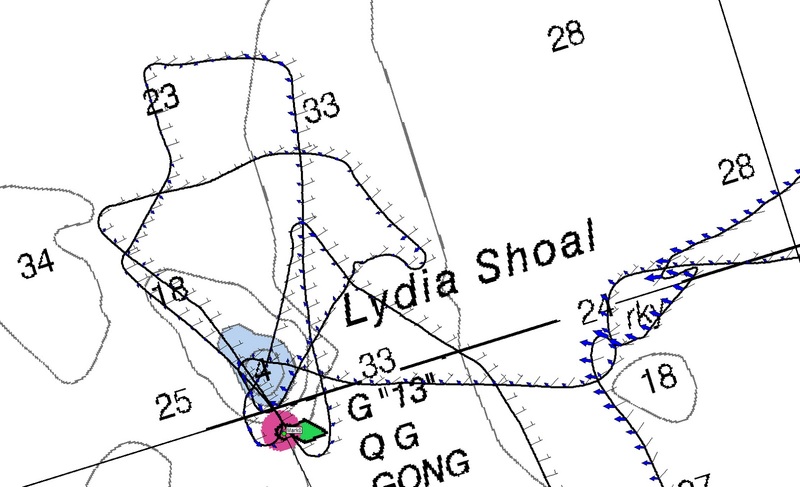 This was where we really accelerated away from the rest of the fleet, sailing downcurrent and being fully powered up in 8-10kt of breeze. Near Clark Island we were headed and ran into the beginning of the flood so we dropped the Genoa Stay Sail, downshifted to our J2 and headed for the beach on the north side of Orcas, beating in up to 16kt of wind. After rounding Pt. 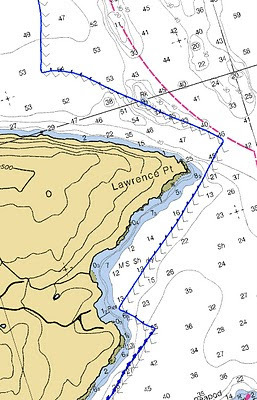 Lawrence the flood hadn’t set in very strongly so we decided to sail up the beach inside of PeaPod Rocks, which was almost rhumb-line line to the finish. We managed to make the finish in good pressure with only a couple of tacks. 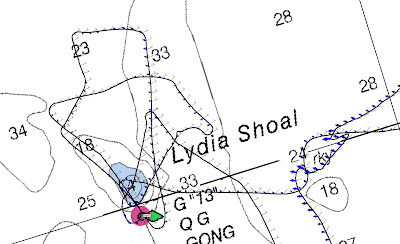 After finishing we observed Flash take the same line as we did, only to be nearly passed by Velos who sailed outside PeaPod Rocks in what appeared to be more pressure and a big left shift. On the way home we felt we had put down a good run, but knew that it was entirely possible for one of the slower boats sailing in different conditions to correct over us. As it turned out this was not to be and later that evening we received a call from the race committee informing us that we had won not only our division, but that we were first overall in addition to being first to finish – a nice surprise and a great finish to our 2010 sailing season! They say horses for courses, and Sunday of RTC 2010 certainly set up well for most of the big boats – Icon included.